A rare marine turtle has been washed up on Cefn Sidan beach in Carmarthenshire, Wales. The warm water Kemp’s ridley turtle was reported to the UK’s Marine Conservation Society by Louise Panes, who found the dead turtle on Tuesday. Louise discovered the animal while walking her three dogs on the beach. The dogs became interested in a patch of washed up sea grass, and Louise initially thought it was a dead seagull: "I went over to pull them away and was surprised to find what looked like a turtle lying alongside the grass,” she said. “At first I thought it looked like a large tortoise, but I could see from its front legs that these were more like flippers than legs. I could see it was dead as it had been damaged by something around the back of its neck, but as I had never seen a turtle on the beach before I was pretty certain that it was an uncommon sight in the waters around Wales." Dr Peter Richardson, the Marine Conservation Society’s biodiversity programme manager added: “It’s not the first turtle to wash up in the recent storms. In December a young loggerhead turtle washed up dead at Worthing, and in the last couple of weeks we have received reports of leatherback turtle remains washed up on Chesil beach near Weymouth, and on Tregantle Beach in south east Cornwall." Two Kemp’s ridley turtles were washed up on Welsh beaches during rough weather in January 2012, both at Llantwit Major in the Vale of Glamorgan. In December 2011 another had been found at a beach in Ceredigion. In the 1980s Kemp’s were on the brink of extinction as a result of hunting and egg collection on the nesting beaches in Mexico, as well as through accidental capture and drowning in shrimp trawling nets fishing in the Gulf. 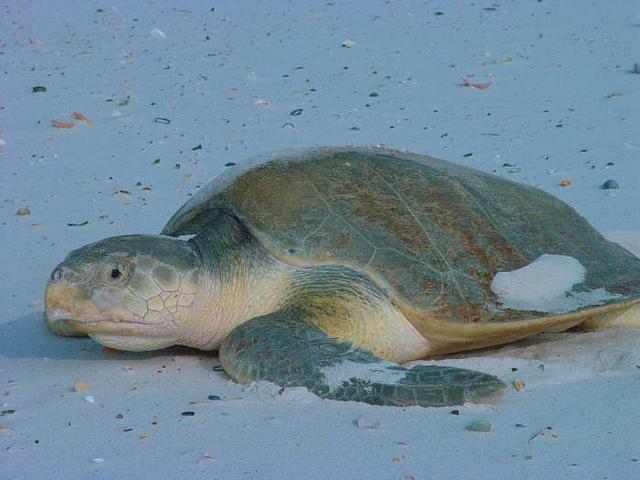 Back then there were only a few hundred females recorded emerging at the main nesting beaches, but since then strict protection on the beaches has been put in place, and the use of special Turtle Excluder Devices in Gulf of Mexico shrimp nets has escalated. These measures have both contributed to the recovery of the species, and now thousands of female Kemp’s ridley turtles emerge to nest each year. "We would ask people to keep their eyes peeled for stranded turtles during this stormy weather,” added Dr Richardson. “Sometimes freshly stranded turtles can appear dead, but they may still be alive and can be rescued. They should NOT be put back in the sea, as this will definitely kill them. Instead they should be moved away from the water to a sheltered place, preferably in a cardboard box out of draughts, and reported to experts for collection. Even if they are obviously dead they should be reported as they can be used for post-mortem research."